Khomeini’s expressed mission, however, was not simply to seize control of Iran. He vowed to “export the Islamic Revolution.” Iran has been funding terrorist and subversive groups ever since. If Egypt falls into the hands of the Radicals, this will be a disaster of historic proportions. Egypt and Iran would be the Twin Towers of the epicenter, two nations that have collapsed at the hands of the jihadists who are determined to rebuild the Islamic caliphate and usher in the End of Days, even if many in our foreign policy establishment don’t recognize this. To surround Israel, destroy the Jews, and capture Jerusalem for Islam. This is why the Iranian regime is so excited by what is happening in Egypt, and determined to help where and how they can. 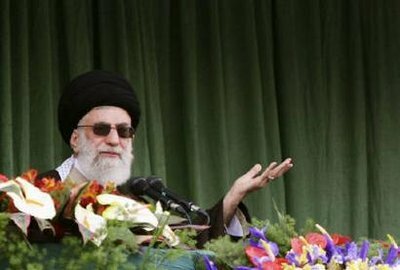 “Uprisings in Egypt and Tunisia will spell an ‘irreparable defeat’ for the United States, Iran’s Supreme Leader Ayatollah Ali Khamenei said on Friday, adding that the recent wave of unrest sweeping through the Mideast was a result of Iran’s Islamic Revolution,” reports Reuters and Haaretz. « MY CONVERSATION WITH CBN ON EGYPT CRISIS AND MOHAMED ELBARADEI: Note, Epicenter Conference and Israel tour sold out.